A fine riparian area, plenty of evidence of the area's mining past and good views from the Huachuca Crest are some of the rewards you'll reap along this trail. After detouring around a piece of private property, the trail drops back into Miller Canyon to follow what was once an old mining road. The trail passes the remains of the townsite of Palmerlee and a number of abandoned mining digs as it slants steadily up the canyon. Down in the bed of Miller Creek, which usually has water in it year-round, you'll be able to see lengths of the old carbon steel pipe which were placed here in the nineteenth century to carry water to the boomtown of Tombstone. Along lower stretches of the trail, large old sycamore trees shade the streambed, and sunlight filters down through the limbs of tall Douglas-firs. There are a number of bigtooth maples along the streambed in this area, too, making it a colorful place to visit in mid to late October when the leaves of these trees paint the canyon in hues of orange, red and yellow. After crossing the stream several times, the trail switchbacks its way up the north side of the canyon into an area that was burned by a large forest fire in 1977. Here, you'll find good views down-canyon of the San Pedro Valley and the Mule Mountains around Bisbee while Miller Peak stands high above the canyon rim to the southwest. 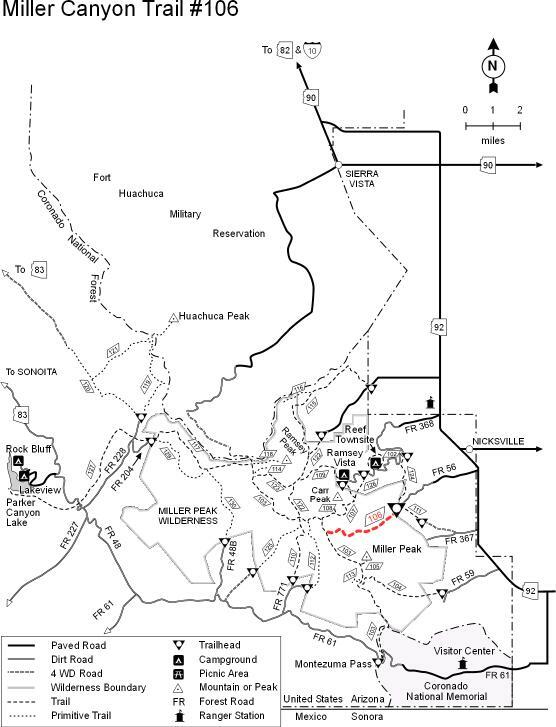 From this point, the trail continues to climb, visiting the stream a couple of more times and passing several more old mine sites before it intersects the Crest Trail #103 high in the Huachucas. Views of peaks and valley. Historic mining area. Fall colors. Access to Huachuca Crest. 3.3 miles of this trail are within the Miller Peak Wilderness. Purification of water is recommended prior to use. Impacted by the Monument fire and post fire rains, especially in the first mile from the trail head. In November 2011 CREC (Coconino Rural Environment Corps) started work from the junction of the Crest trail down, rebuilding about a mile of the trail. The trail maintenance has been completed as of April 2012, new signs have been installed.